Enjoy seaside holiday in the beautiful city of Spotorno in Liguria, Italy. The Parish Church of Santissima Annunziata which dates back to 1694, and is located in the historic centre of town, is worth seeing. You will find many valuable works of art from the 17th and 18th centuries inside this church. The oratorio which forms part of the church building, also has some valuable paintings. Very interesting too are the old defence installations, which are still well maintained; the first installation dates back to the 12th century. Most of the preserved walls date from the 16th Century. They are former observation posts, which were constructed by the Republic of Genoa for purposes of better monitoring of the frequent pirate attacks. In the area around Sportono lies the nature reserve. One can take nice, extended walks in the surrounding forests and meadows. But even the coast and the sea have their own special charm. The first beach facilities, Colombi and Cerutti, still offer wonderful sandy beaches for bating and relaxation even today. Sportono was built in the early medieval times. In the 12th century it was then under the rule of the Del Caretto family, which gave the village to the bishops of Savona, who already owned the castle. In 1385 the village was sold to the Republic of Genoa, and it became one of the most important localities in the republic under Genoan rule. The economy was mostly driven by the sea trade, which Sportono carried out with Sardinia, Spain and Sicily. After the fall of the Genoan Republic, Sportono returned to the Ligurian Republic and was integrated into the first French empire in 1805. From 1815 onwards Sportono belonged to the Sardinian kingdom, and in 1861 it was passed over to Italy. 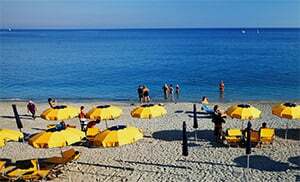 Through the construction of the railway line between Genoa and Nizza in 1872 tourism gained momentum and at the beginning of 20th Century hotels and beach clubs were built. From 1973 to 2008 Sportono was part of the mountain community of Pollupice. Sportono is a locality in the province of Savona which lies in the Liguria region. In the vicinity of Sportono there are still several localities like: Bergeggi (4.3 km), Torbora (2.8 km) and Case Badino (4.8 km). When coming from Genoa along the E80, take the exit to Sportono.